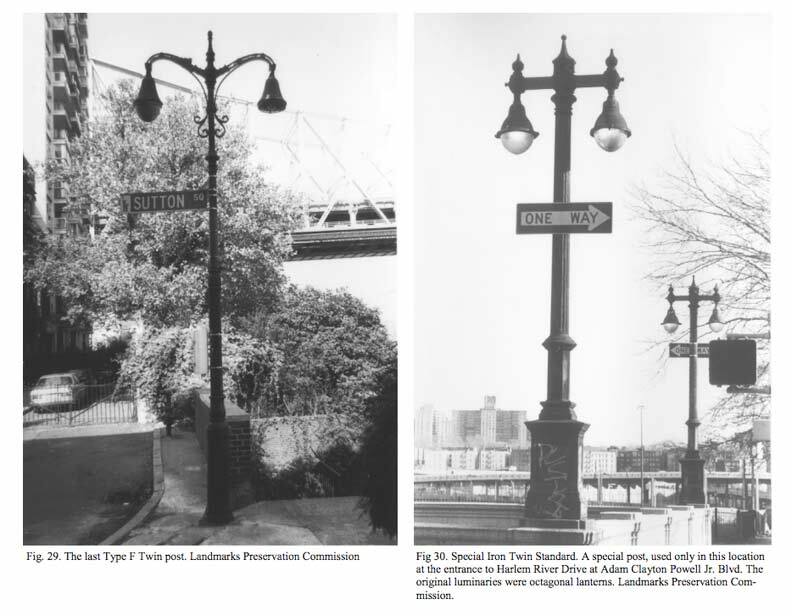 In 1997 the NYC Landmarks Preservation Commission did a survey of the remaining early 20th Century lampposts that were scattered around town. Your humble webmaster wishes I could’ve been involved, and if they ever do another one, I’m their boy. Anyone have an in with the LPC? Unfortunately, there are plenty of landmarked posts that the Department of Transportation has seen fit to destroy. To their credit, some of these posts have been rehabilitated and replaced, good as new, but in most cases, they were summarily removed and destroyed. The posts shown on this spread, taken from the document, are long gone. The LPC’s notes are incorrect about the post on the left. It indeed was the last Twin Type F on Manhattan island, but in 2005 I discovered another on the campus of SUNY Maritime College in Soundview, Bronx. However, that one, as well, has gone. 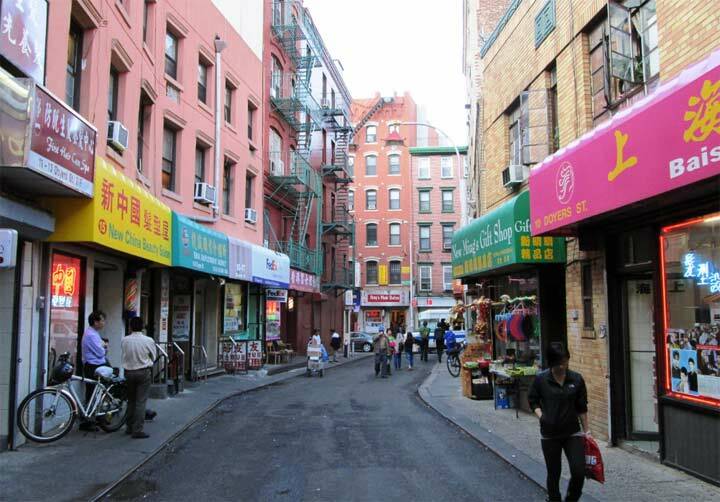 The city has been populating selected streets with new retro-style Type Fs of late, but no twin versions. The twins on the right, at A.C. Powell Boulevard (7th Avenue) and West 153rd, were finally taken down about three years ago. There are, however, some samples remaining on the Riverside Drive viaduct at West 158th Street. Linden Boulevard in Brooklyn used to be filled end to end (Kings Highway to Conduit Boulevard) with Type F’s until about 1962 or 1963. Twins in the dividers; singles along the service roads. I didn’t know that about Linden Blvd. I took a bike ride from Bay Ridge to Rosedale in 1975 down Rockaway Bloulevard past JFK and I was amazed to find a flock of Twin Type Fs and single Type Fs still in place. Do you know when they were replaced? Actually they were removed from Linden Blvd in 1958. Replaced by what probably were the first mercury streetlights in Brooklyn. Type Fs, both single and twin, were used along Riverside Drive in Manhattan for many years but vanished in the mid-60s, as I recall. Twin Type Fs were also common in the median of Rockaway Boulevard alongside the north boundary of JFK Airport as well. The ones pictured at 153rd and Seventh Avenue in Manhattan were similar to the lighting fixtures along the Miller Highway (West Side Elevated Highway) between 72nd and Canal Streets. Finding your site was a revelation for me. I thought I was alone about NYC street lights. I could read about NYC history all day. Keep up the good work.